Illustrated guide to reading the label of diamond disks. 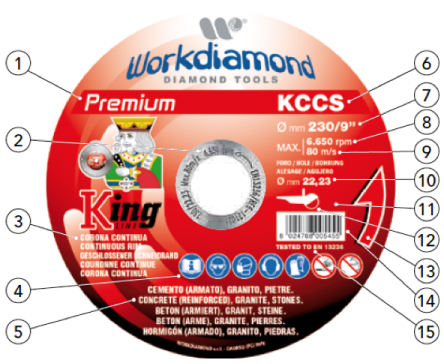 Reading the label of our diamond tools will allow you to make the right choice based on your needs. Tracking codes engraved on the steel core. Safety pictograms, prohibitions and obligations. Main families of materials on which the tool can be used. Commercial code in the catalog. Nominal diameter of the disk in mm and inches. Maximum speed limit of rotation in r.p.m. (revolutions per minute 1 / min). Maximum limit of peripheral speed (meters per second m / s). Diameter of the central hole of the tool (machine shaft). Obligation to use wet (if the symbol of the drop appears). Machine on which the tool can be used. Arrow indicating the correct direction of rotation for assembly (cutting direction). 1)	Bar code type EAN 13 for automatic reading with optical systems (Barcode). Declaration of conformity, tested according to EN 13236 (European safety regulation).